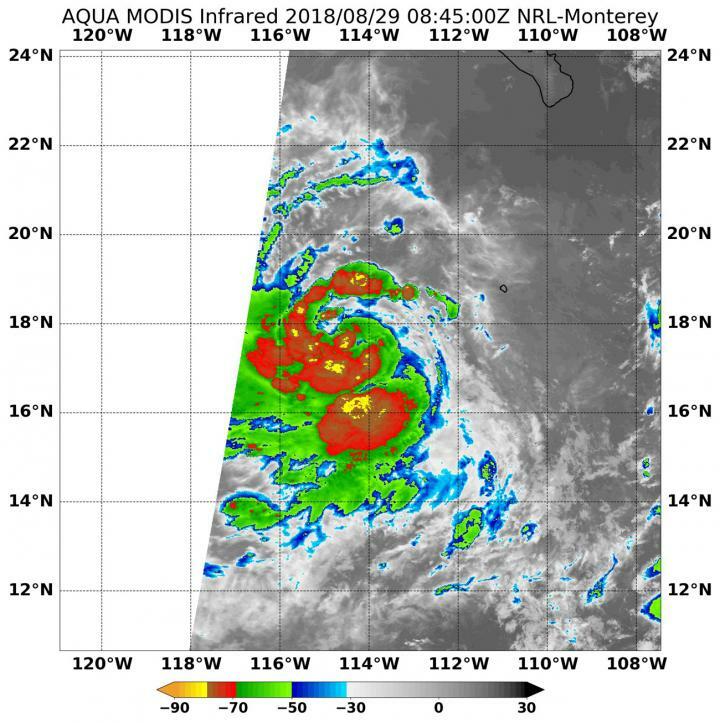 NASA's Aqua satellite provided valuable temperature data on Tropical Storm Norman in the Eastern Pacific Ocean. Aqua data showed Norman was quickly intensifying. On Aug. 29 at 4:45 a.m. EDT (0845 UTC) the Moderate Resolution Imaging Spectroradiometer or MODIS instrument aboard NASA's Aqua satellite found the coldest temperatures of the strongest thunderstorms in Tropical Storm Norman were north and south of the center and were as cold as or colder than minus 80 degrees Fahrenheit (minus 62.2 Celsius). They were embedded in a large area of storms where cloud top temperatures were as cold as or colder than minus 70 degrees Fahrenheit (minus 56.6 degrees Celsius). NASA research has shown that storms with cloud top temperatures that cold (that are very high in the troposphere) have the capability to generate heavy rain. The National Hurricane Center (NHC) noted today, Aug. 29 that Norman is forecast to rapidly intensify and become a hurricane later today. Forecaster Berg of NHC said "Norman's infrared satellite signature has the look of a cyclone ready to strengthen significantly over the next couple of days. Banding continues to increase, with the convective canopy expanding in nearly all quadrants." At 5 a.m. EDT (0900 UTC), the center of Tropical Storm Norman was located near latitude 17.5 degrees north and longitude 114.6 degrees west. That's about 480 miles (775 km) southwest of the southern tip of Baja California, Mexico. Norman was moving toward the west near 10 mph (17 kph). A fairly steady westward or west-southwestward motion is expected during the next several days.